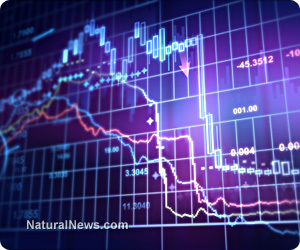 (NaturalNews) Not much prone to gimmicky pronouncements or over-hyped predilections, a noted financial expert says hold onto your 401k and investment portfolio, because by the second half of this year, there could be a major financial disaster not unlike the market crash of 1987. The S&P has rallied 19 percent in 2013, which is impressive by any measure. But the market did far better in 1987, when stocks added more than 30 percent from the beginning of the year to Aug. 8. The problem? The market ended up tanking in the second half of that year – dropping 36 percent from the Aug. 25 peak to the October low, before closing out 1987 nearly exactly where it began. And now, the publisher of the Gloom, Boom & Doom Report, Marc Faber, believes the very same cycle will repeat itself later this year. Faber said Thursday, Aug. 8, that is exactly where we are this August. What that means is the market is now reliant on a very small number of companies. If they continue to do well, then things will be fine. But at what point will they decline? And is there much hope for the smaller companies not doing so well? “The only way this market can go up is if the 10 or 50 stocks that are very strong continue to drive the market higher, with the majority of stocks having actually peaked out,” said Faber. This so-called macro environment, noted CNBC, is only getting tougher. “Some of the tailwinds we’ve had – such as massive monetization and falling interest rates – are no longer in place,” said Faber. Faber isn’t the only predictor of doom and gloom. In June, another economist said he believes there is an 87 percent chance there will be another market meltdown this year. In “Stocks for the Long Run,” economist Jeremy Siegel researched all the “big market moves” between 1801 and 2001. Bottom line: 75 percent of the time, there is no rationale for “big moves.” No one can predict them. Maybe technicians and traders can pick short-term moves the next second. Maybe tomorrow. But the long-term “big market moves?” No way. So why predict an “87 percent” chance of another meltdown in 2013? Because in the real world of statistical probabilities, historical facts and expert opinions danger signals are flashing wild. out to pasture,” Farrell wrote. He lists 10 reasons why the market, at its current pace and level, is not sustainable. One of those reasons contains a familiar economic term: bubble. Read them here.